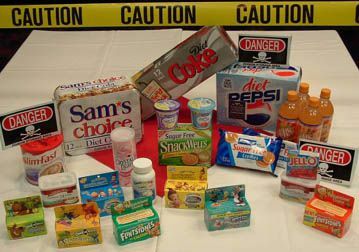 According to The Center for Science in the public interest (CSPI), a US organization that campaigns for food safety, many additives should be avoided on health grounds. The sugar substitute Aspartame is sold commercially as Equal and Nutrasweet. One out of 20,000 babies is born without the ability to metabolize phenylalanine from any dietary source. Phenylalanine is a naturally occurring essential amino acid found in all protein (including mother's milk) and is one of the two amino acids in aspartame. All children are screened for phenylketonuria at birth and any found with it have to follow a strict diet for the rest of their lives, controlling the amount of protein they consume. There is some evidence to suggest toxic levels of this substance in the blood can result in mental retardation. Scientists are also investigating a possible link between aspartame and changes in brain function. People have reported dizziness, headaches, epileptic-like seizures, and menstrual problems after consuming aspartame.